Cigarette smoking is a leading risk factor for morbidity and premature mortality in the United States, yet information about smoking prevalence and trends is not routinely available below the state level, impeding local-level action. Tanja Srebotnjak of Ecologic Institute and co-authors now publish county-level estimates of cigarette smoking prevalence: These provide a unique opportunity to assess where prevalence remains high and where progress has been slow. The estimates provide the data needed to better develop and implement strategies at a local and at a state level to further reduce the burden imposed by cigarette smoking. Tanja Srebotnjak et al. 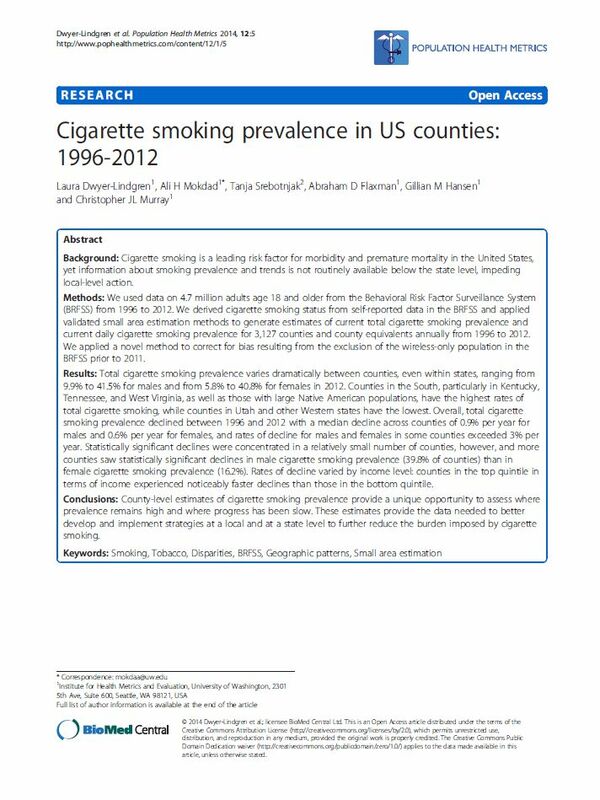 2014: "Cigarette Smoking Prevalence in US Counties: 1996-2012". Population Health Metrics, Vol. 12/2014, 1-13.